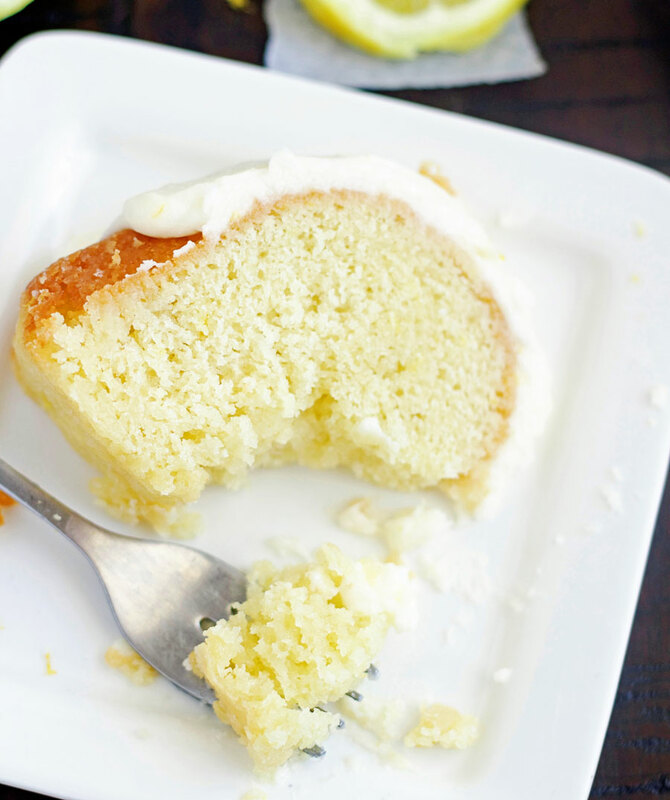 This Perfect Lemon Bundt Cake is just that. . . . perfect! It’s dense, buttery, coated with a sweet lemon buttery sauce then topped with a lemon icing. Absolutely amazing! This Perfect Lemon Bundt Cake has been a labor of love. It’s only take me 17 tries to get it just right. Ok, really only about 5 attempts, but it has felt like 17. I am completely in love with this Coconut Cake and this Kentucky Butter Cake (they’re both amazing and you need to make them if you haven’t!). I took the best of both of them and this Perfect Lemon Bundt Cake was born. It’s super easy to make, like dump everything in the mixer and mix easy. The flavor is so perfect. It’s lemony, buttery and sweet with just the perfect amount of tartness. The texture is dense, but still tender. The lemon icing is fabulous. Finally, my most favorite part of the cake is the ridiculously good buttery, sugary, lemony sauce that soaks into the cake while also leaving a sugary crust on the cake. The bottom, that once was the top, with the crusty, sugary butter sauce is to die for! I wish you could reach through and take that bite right there. You’ll just have to trust me when I tell you it is pure heaven! This cake is even better the second day. I always make it the day before I’m going to serve it. I follow the instructions up through pouring the butter glaze on and then I let it sit overnight. I make the lemon icing and pour/spread it on top the next day. Make sure you heavily grease your bundt pan. I use butter or crisco and then dust it with flour. I’ve never had this cake stick when I grease my pan that way. Once the cake is baked, poke holes in it and then make your butter glaze. This gives the cake just enough time to cool slightly before you pour the glaze on top. Allow the bundt cake to cool completely in the pan so the butter sauce has time to soak in and also set up on top. This will give you the the yummy crackly, buttery top that is pretty much life! Grease a 10" bundt pan with butter or shortening and then dust the pan with flour and set aside. After the cake is done, make the glaze ingredients by combining the sugar, butter, lemon extract and the water. Cook over medium heat, until fully melted and combined, BUT DO NOT BOIL! Let the cake to cool completely in the pan and then invert onto a serving plate. Make the lemon icing by mixing the powdered sugar, butter and cream together until just combined, add in the lemon juice and zest. Spoon over cake and spread slightly so it runs down the sides. Please make sure you grease and flour your pan really well. Spray, such as Pam, just doesn't work well for this cake. Make sure you use butter or shortening and get in every crease of your pan and then flour it also. Also, make sure you make the glaze after the cake comes out of the oven, that gives the cake a chance to cool just a bit. If you pour the glaze on as soon as it comes out of the oven then the cake is so hot it quickly absorbs the glaze and the sugary, crusty coating doesn't form on the outside. For the lemon icing, you want it not too thick, almost more of a "thick pourable" consistency. Jodi, Matt and I LOVED this cake! I’m a chocolate lover, but this was delicious! It was super moist, the frosting was heavenly and the glaze was an added bonus. That was probably my favorite part of the cake! Thanks for the recipe! Hope you all are doing well! Hi Tiff! Thanks for letting me know how much you loved this cake! I love hearing comments like that. I totally agree about the glaze being an added bonus. We are doing good and I hope you guys are too! Miss you guys. 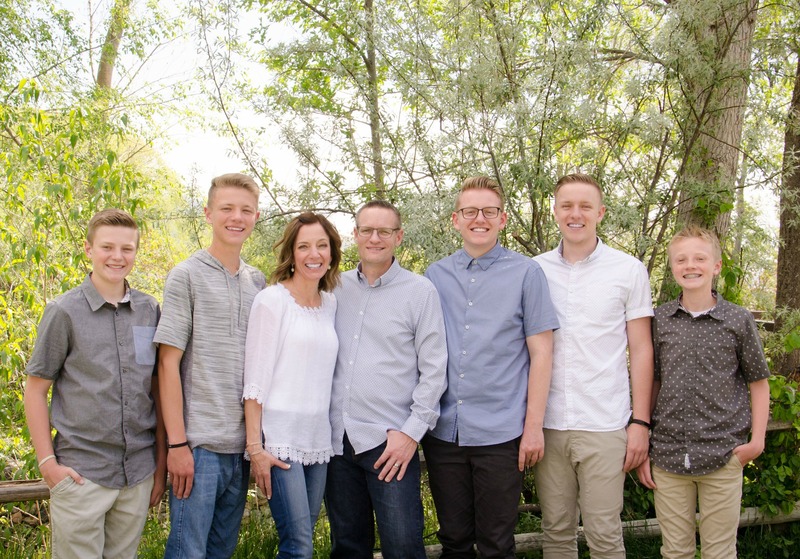 Tell Matt and the kids hi. I made the butter bundt cake, it didn’t, come out of the bundt pan stuck, but had a great taste. This time I tried the lemon bundt cake it didn’t rise too high. I did sututite vinger and milk for buttermilk. Any ideas why the cake didn’t rise? I’s sorry to hear it stuck. Did you use shortening and flour? I’m not sure why your cake didn’t rise, there are always lots of different reasons? If you used a larger bundt cake pan, then it wouldn’t rise as high. Sorry it didn’t work out. I made this cake for Thanksgiving but I messed up the icing and made it too watery so I didn’t like the way it looked. It wasn’t as pretty as yours. However, I put it out anyway and everyone remarked how gorgeous the cake looked. It was the IT dessert at Thanksgiving. Everyone ranted and raved about how good it tasted. We had about 6 different dessert options and there was only a tiny slice left of this cake at the end of the night. Thank you so much for this recipe. It was super easy, but I felt like I was zesting lemons forever. I definitely will be making this again. This may be my go-to for potluck dessert contributions. However, I will NOT second guess the icing next time and make it exactly per your recipe. Hi Kia! I’m so happy to here that this cake was a huge hit. I love hearing stories like you shared, thanks for taking the time to leave a comment. Hey, who cares how pretty it looks, as long as it tastes good, right? Thanks again for letting me know. If you like coconut, you should try the coconut bundt cake, it’s crazy popular on my site and is insanely delicious! 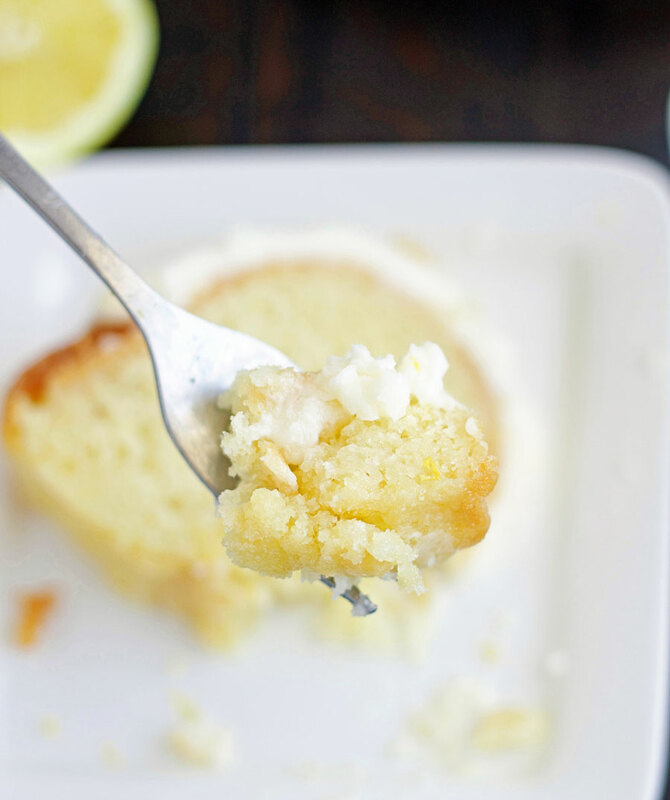 If you’re not a fan of coconut, then the Kentucky Butter Cake is another amazing one. Take care! What’s your recommendation if I don’t have lemon extract?